Well hello, TAY! Long time no see; in fact, it’s been exactly a year (and a day, but who’s counting). For some reason, it is always around New Years that I become a bit nostalgic for my time spent writing here. Maybe this is the only place that I can truly revel in my self-deprecation. No where else can I say: “Yes, I only finished three games!” and not feel like a crabapple. And yes, predictably, this is the truth. I have only finished three games this year. 2017 might have been a year of utter chaos worldwide, but in the realm of my hobbies, much has stayed the same. 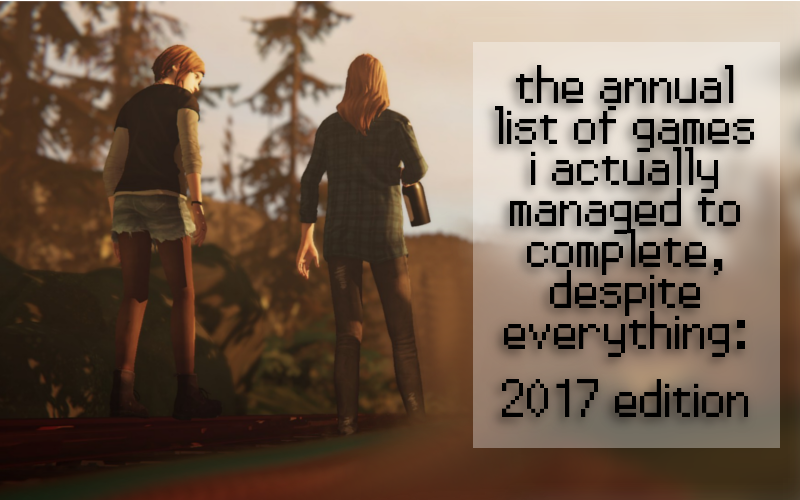 It’s funny: until this morning, I had totally forgotten that I did a review of the original Life is Strange in 2015. Two years ago, I seemed pretty confident that it was the best dang thing that had ever happened to the narrative-driven game genre. Well, past Celia, I raise you this: the prequel does it better! God, if I wasn’t totally too late, I’d do a review of this game as well. Well, ok, maybe it’s not too late; here’s my unofficial review: take more of my money, Decknine. Take it all, and then some. Rachel Amber absolutely illuminates this game. She plays this game of chicken with Chloe that really straddles the line between irresistibly enticing and subtly manipulative. It’s a “real” relationship unlike anything that I’ve previously seen portrayed in games. This series has definitely cemented itself as a masterwork in its genre; nothing captures raw emotion like exploring the treasured, dumb, dramatic relationships of our teens. Oh man, Pyre. This one definitely took me for a ride! If you’ve familiarized yourself with my terrible (terribly impeccable) taste throughout the past few years, you’ll know that my first priority in buying games is that they have strong characters. Pyre fits the bill, and then eats the bill. What’s in the water over there at Supergiant? Insanely potent character creation syrup? Anyway, Pyre is a deliciously well put together sports game, and I usually hate sports games. This game made me rethink my apathy about sports! Not even this year’s Superbowl made me do that, and I live in New England. My only gripe with Pyre was in the execution of its ending. There were so many good characters, and I just wish I had gotten to play with them a bit more in the aftermath. But reading about them was nice, too. Ah, VA-11 Hall-A. This game is definitely what you would call niche. Or, atleast, niche-adjacent. It combines several genres, moods, and aesthetics that don’t necessarily have anything in common, and blends them into an effortlessly charming game-smoothie. I have similar praise for this game that I do for Pyre. I’d even go farther to say that the characters in VA-11 Hall-A resonated with me even more. You really fall into Jill’s shoes, comfortably putting together exquisite cocktails and making unassuming conversation. This game is also complemented heavily by a fabulous art style, excellent world building, and a gameplay mechanic that, while gimmicky on the surface, manages to never really get old. Honorable Mentions (Per usual: games I loved, but didn’t complete): Nier: Automata, which is probably my game of the year, had I finished it. Unfortunately, I am forever stuck in that one section where the game weakens 2B so she can’t fight, but has to walk like a hundred miles. It’s just such a hassle. I also enjoyed Shadow of Mordor a lot, but after 13 hours, I don’t find the story compelling enough to finish it. Happy Holidays, and have an absolutely wonderful New Year, TAY. My resolution is to spend more time around here in 2018, reading all the creative and compelling content you all write with a devotion that I can only envy.